As a commercial landlord, you will be approached about your tenants wanting to sublet their spaces. Considering many commercial leases last for multiple years, tenants that are going out of business or need to move to a bigger space may look toward subletting as a way to relieve themselves of their rental obligation. Subletting is often in your own best interest. However, you cannot simply say yes to every potential sublessee. You must perform your due diligence and follow your original lease terms. When a commercial tenant subleases to another party, your original tenant does not transfer all of its right and obligations to the new party. 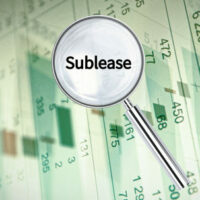 Usually, a sublease is for all or only a part of the premises for a term that is less than the remainder of the lease. Your original tenant is contractually obligated to you, which means it can be held responsible for rent, utility payments, and other duties laid out in the lease. You do not have a direct contractual relationship with the new tenant. However, you will obviously need to have a business relationship with the new party to ensure the transition goes smoothly and that you receive what you are entitled to. It is far better to work with the sublessee than to have to fight with the original tenant. Your exact power over a sublease will depend on the contract you have with your tenant. In most commercial leases, you retain power over who may occupy and use the premises. You may even have the right to approve or veto a potential sublessee. If you are unsure of your rights in regard to your commercial tenant subletting their space, contact an attorney right away. The amount of due diligence you must complete is generally controlled by the commercial lease. Additionally, you are usually required to approve a potential sublessee unless you can reasonably reject the applicant. It may be reasonable to deny a sublease if the incoming party appears to be unable to fulfil the financial obligations of the lease, such as make rent payments, or wants to use the space in a way that conflicts with permitted uses within the lease. As a commercial landlord, you often have to approve a sublease and it is in your interests to do so. However, there are times when a potential sublessee is not an appropriate tenant for the space. For questions regarding your rights and duties in regard to commercial subleases, contact a Boca Raton commercial real estate attorney of the Law Offices of Larry E. Bray at 561-571-8970.